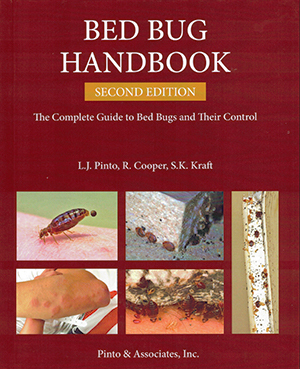 The Bed Bug Handbook is a guide to bed bugs and their control. Extensively illustrated and with 286 pages, the handbook provides practical step-by-step guidance for preventing bed bug infestations and for controlling bed bug outbreaks. It includes details on bed bug inspections and methods of control including mechanical (encasements, vacuuming), thermal (dry heat, steam, and cold), insecticide treatments, and fumigation. The first edition of the Bed Bug Handbook is out of print. Copies are still available on Amazon and other sites. A new, completely revised edition will be available in 2017.